Article from Bloomberg by Greg Stohr. 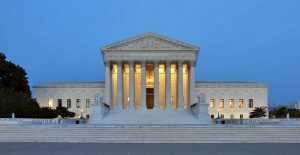 The U.S. Supreme Court ruled that rental-car drivers may have the right to prevent police from searching the vehicle, even if they aren’t authorized to drive it. The court unanimously sided with Terrence Byrd, who is challenging a conviction stemming from the heroin and illegal body armor that Pennsylvania state troopers found in the trunk of a car he was driving. Byrd’s onetime girlfriend had rented the Ford Fusion, and he wasn’t on the rental agreement. The high court said Byrd had a legitimate expectation of privacy within the car, bolstering his claim that police violated his constitutional right against unreasonable searches. The justices sent the case back to a federal appeals court to consider other arguments pressed by the government. Seems odd that the same Supreme Court spends so much time ducking cases where a LAW ABIDING CITIZENS constitutional rights under The Second Amendment are trampled on. One wonders as to why the court so acts.